Peterson Nelnet Co, 9780768940800, 312pp. 5 star reviews for this guide. "This book is a must read for parents with children, of all ages, who plan to send their kids to college. 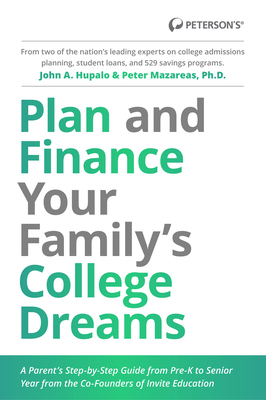 In understandable terms, Hupalo and Mazareas, have demystified the college finance and admissions process with easy-to-follow steps to college finance self-sufficiency." "As a financial advisor of 20 years, I found this book to be an ideal balance of easy to read, substantial range of information, and helpful at the same time. Well written I intend to buy several to hand out to my clients who have children or grandchildren heading to college." John Hupalo is a nationally recognized expert in education loan finance and private credit student loans-having structured or securitized more than $50 billion of student loans, helping over 1 million students finance their educations. His career spans three decades with senior positions of a publicly traded education finance company and as Manager of a number of Education Loan Groups on Wall Street. In 2012, he co-founded Invite Education to empower families with better information, tools, and services to more effectively plan and pay for college. John began his career in 1982 on the Washington staff of Congressman John Porter, a member of the Appropriations Subcommittee on Education and Labor. From 1987-2003, he was a member or Manager of Education Finance Groups at Manufacturers Hanover Securities Corporation, Salomon Smith Barney, PaineWebber/UBS, and Deutsche Bank (2010). In 2003, he joined First Marblehead Corp., where he participated in the IPO and served as Senior EVP and Chief Financial Officer. Mr. Hupalo received his B.A. with Honors from Boston University in 1982 and an MBA in Finance from NYU's Stern School of Business in 1987. He has testified before Congress, frequently speaks at industry conferences, and has had articles published in U.S. News & World Report, the Association of Finance Professional Exchange, and the Greentree Gazette. Dr. Peter Mazareas is considered one of the nation's foremost experts on college planning and financing.He is one of the founders of 529 Plans, having worked with Congress on legislation to enable the creation and implementation of 529 savings plans. Peter helped establish and was elected Chair of the two 529 Trade Associations-the College Savings Plan Network (CSPN) and the College Savings Foundation. As a consultant, he helped design, launch, and market several of the nation's largest 529 Programs. He is the former Executive Director of the Massachusetts Educational Financing Authority, where he implemented some of the nation's first college loan and 529 savings plans. He is featured at national conferences and has been quoted and interviewed in a variety of national publications and radio and TV shows, including The Wall Street Journal; USA Today; Kiplinger's; CNN; PBS; Bob Brinker; Money Magazine; Smart Money Magazine; and Investment News. Dr. Mazareas has also served as Deputy Treasurer, Commonwealth of Massachusetts. He was a senior administrator and on the faculty at 3 universities, including as a full-time Professor of Business at Boston College's Carroll Graduate School of Management. He is a co-founder of Invite Education. Dr. Mazareas received a B.A. from Harvard College and an M.B.A. and Ph.D. from the University of Chicago.